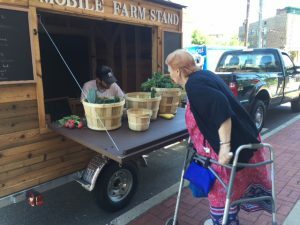 Thanks to Professional Woodworkers Guild of Upper New Jersey, the Montclair Community Farm Coalition now has a mobile farm stand to take local produce from its farm sites to area seniors. The Coalition operates two primary microfarm sites – one behind the HOMECorp building on Miller Street and one at the Montclair Historical Society on Orange Road. This summer we will be selling produce at affordable prices to seniors by setting up shop in the farm stand at Montclair’s senior housing buildings. Following our visits to local senior centers, our mobile farm stand will be open at our Montclair Historical Society location, 108 Orange Road, from 3 – 6pm every Friday starting July 1st. Community members are welcome to visit us at any of the listed sites at the designated times. Seniors will receive a discount card during their first visit to the stand. 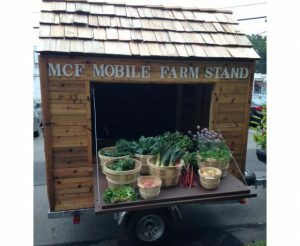 The Montclair Community Farm Coalition consists of local organizations committed to engaging the community in farming, food, agricultural and nutrition education. These local community farms are hands-on resources to create a healthy food environment to support healthy food and lifestyle choices. The members of the Montclair Community Farm Coalition are HOMECorp, Montclair Health Department, Montclair Historical Society, Montclair State University, and Rutgers Cooperative Extension of Essex County: Essex 4-H and Master Gardeners. 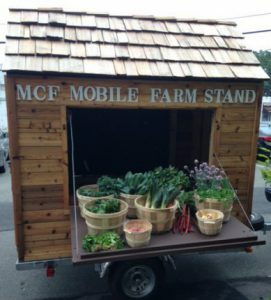 The Professional Woodworkers Guild of Upper New Jersey built the farm stand using reclaimed lumber in the carpentry shop of Matthew Weiss, MCW Carpentry, LLC, current president of the guild. Other members of the guild, who contributed their time to help with the construction are: James Scott of MCW Carpentry, Harold Katchen of HK Carpentry and Home Improvements, Frank Mangravite Ph.D. of Public Works Management LLC, and Glen Guarino of Guarino Furniture Designs, an award-winning furniture designer and Professor at Kean University. 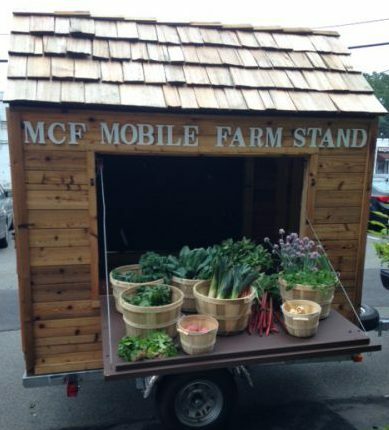 To see our Mobile Farm Stand in action, click here!